Congratulations Brian Hulme! 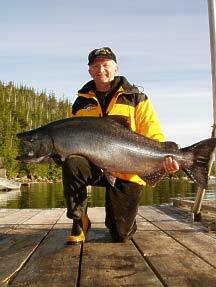 Brian wasn’t quite satisfied with catching the largest tyee of the year in 1999. Consequently he did it again. Yes, this is Brian’s second time as the “Top Rod” of the year. Furthermore, Brian is the first Black Gold Guest to win the free trip for largest tyee of the year two times. Five seasons ago when we asked, “What are you going to do for an encore Brian?” we certainly didn’t expect this. Way to Go!